Finkelshteyn has been featured as soloist with numerous orchestras including the Baltimore Symphony Orchestra, St. Louis Symphony Orchestra, Detroit Symphony Orchestra, Mostly Mozart Festival Orchestra, Baltimore Chamber Orchestra, Saint Paul Civic Orchestra, the Peninsula Music Festival Orchestra, National Repertory Orchestra, Bardy Symphony Orchestra (England) and the Cincinnati Symphony Orchestra. Finkelshteyn has claimed top prizes of the Concertino Praga, Russian Cello Competition, the WAMSO International Competition, the Aspen Music Festival Concerto Competition (where he was the recipient of a Fellowship) and the Chautauqua Concerto Competition. First prize winner of the Juilliard Concerto Competition, Finkelshteyn performed as soloist with the Juilliard Orchestra on tours to France and Bermuda. An active chamber musician, Finkelshteyn has collaborated in chamber music with such artists as András Schiff, Hilary Hahn, David Soyer, Richard Goode, Joseph Silverstein, Steven Ansell, Harold Robinson, Vadim Repin, Isidore Cohen and Lydia Artymiw, and has been featured at the Aspen, Marlboro, Mostly Mozart, Innsbrook, Bay Chamber and Peninsula Music Festivals, the Linton Music Series and with the Jupiter Players in New York. Finkelshteyn has been featured on Wisconsin Public Radio, Maine Public Radio, KFUO-FM in St. Louis, WYPR in Baltimore, WGUC in Cincinnati and has recorded on the Sony Label. While Finkelshteyn maintains a busy private teaching studio, he presents frequent public master classes at major conservatories of music across North America including the Manhattan School of Music, Peabody Conservatory, Indiana University, University of Cincinnati College-Conservatory of Music (CCM) and at the University of California Chico. He has also been on the faculties of the Jonannesen International School of the Arts, Victoria, Canada, NOI and Orchestra Academy at Indiana University. 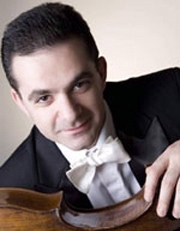 In January 2012 Finkelshteyn was appointed to the faculty of CCM where he teaches applied cello lessons and will design and teach a new orchestral repertoire audition course for cello beginning Fall Semester 2012. Finkelshteyn was born in Leningrad of the former USSR and began his musical training in St. Petersburg Conservatory Special Music School under the tutelage of Sergei Chernyadiev. Once he immigrated to the United States, he continued studies with Tanya Remenikova at the University of Minnesota the year before attending the Juilliard School for both undergraduate and graduate studies as a full scholarship student of Harvey Shapiro. Chamber music coaches include Felix Galimir, Samuel Sanders and members of the Juilliard String Quartet. Finkelshteyn won his first orchestra job with the St. Louis Symphony prior to his graduation where he performed for five seasons under the late Hans Vonk. From 2002-2009 he performed as principal cellist of the Baltimore Symphony Orchestra under the baton of Yuri Temirkanov, departing in 2009 to become principal cellist of the Cincinnati Symphony Orchestra where he holds the Irene & John J. Emery Chair. Finkelshteyn's performs on a cello by Giovanni Crancino, c.1700. In his spare time he enjoys golf, reading, museums, billiards and table tennis. BM and MM, The Julliard School, New York, NY.